Will Geer introduces Woody by his full name, Woodrow Wilson Guthrie, and points to the instruments he played… ‘guitar, mouth harp, mountain fiddle, mandolin’. Robert Ryan shows the man’s commitment as he describes the guitar in Woody’s hands and its message of ‘this machine kills fascists’. 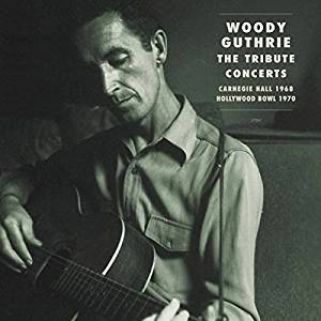 The narrations are part of a recent triple-disc release from Bear Family Records, Woody Guthrie, The Tribute Concerts. Will Geer and Robert Ryan are on stage at the Carnegie Hall performance (January 20, 1968), with Will Geer and Peter Fonda at the microphone for the Hollywood Bowl tribute (September 12, 1970). After a fifteen-year battle with Huntington’s Disease, Woody Guthrie passed away on October 3, 1967. The outpouring of songs come from artists inspired by Woody Guthrie, the events a celebration as they remember the man. Musical backing for the shows was provided by The Band (Robbie Robertson, Levon Helm, Rick Danko, Richard Manuel, Garth Hudson) at Carnegie Hall, and a cast of players at the Hollywood Bowl that included Ry Cooder along with then-current and future members of The Flying Burrito Brothers, Chris Etheridge, Gib Gilbeau, and John Beland among other west coast Folk and Roots music luminaries. As part of his Carnegie Hall monologues, Will Geer cited that ‘nobody knows how many songs he wrote, a collector claims over a thousand…but that was just the ones he took the trouble to write down. It wouldn’t include the ones that slipped away in the dusty wind, or the ones that disappeared in the clank and rattle of a freight train’. The tracks on Woody Guthrie, The Tribute Concerts do a fine job of presenting the words of Woody Guthrie and his message for humanity though they do not offer the songs that got away or come close to the thousand collected. Woody Guthrie made a decision not to ‘go commercial’ and traveled by road and by train to play his music for the people on the outer edge of society. Though Woody passed on fifty years ago, the finger he points at the powers-that-be has remained firm. The New York and Hollywood shows offer content previously released on the vinyl versions of the concerts as well as adding in performances not previously available. On stage to tell the story of Woody Guthrie were musician fans of the songman that included Bob Dylan, Richie Havens, Joan Baez, Pete Seeger, Odetta, Judy Collins, Arlo Guthrie, Ramblin’ Jack Elliot, Country Joe McDonald, Tom Paxton, and more. Woody Guthrie’s music has become part of the American fabric as a quilt of life, and his songs are passionately delivered with “Deportee”, “This Train is Bound for Glory”, “Oklahoma Hills”, and “Goin’ Down the Road”. An American song of protest closes out both Carnegie Hall and Hollywood Bowl shows as “This Land is Your Land” shouts out its claim of ownership proudly on stages in 1968 and 1970. The message is still timely and lovingly curated for 2018 by Bear Family Records on the set, which complements the music with two coffee tables books about Woody Guthrie, his times, his music, and his importance.